So many many man-made creations have been inspired by nature, animal physiology in particular. But fashion... Biomimicry even goes beyond the fashionable animal prints we find printed on so many fabrics these days. Here, for example, is a Bird Skull Shoe, and I don't need to tell you what inspired it. 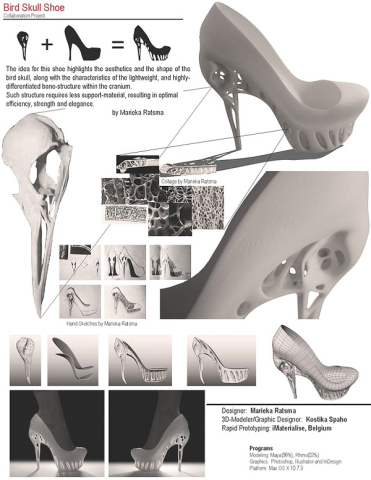 Dutch designer Marieka Ratsma along with American architect Kostika Spaho created this very elegant shoe biomimicking the structure of a bird's hollow skull. Not all parts of the skull connect directly to each other, however, as the toe of the shoe is modeled after the bird's cranium structure and the heel after the bird's beak. The idea for this shoe highlights the aesthetics and the shape of the bird skull along with the characteristics of the lightweight and highly-differentiated bone structure within the cranium. Such structure requires less support-material, resulting in optimal efficiency, strength, and elegance. 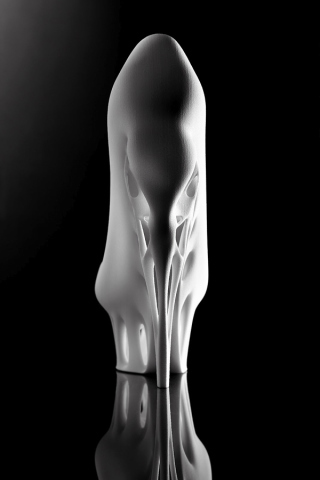 No mention if this 3D-sculpted shoe might ever shoe-up on the runway. Will Hipsters Can PBR For The 'New' Budweiser?